Mexico has its history of mermaid legends, but never coming from the seacoasts. The heart of Mexican mermaid territory is the lake regions of the altiplano, the highland region of central Mexico spanning from Puebla all the way to Guadalajara, with special emphasis on the small lakes and other water sources found in the state of Mexico, just west of Mexico City. Stories about half-woman and half-aquatic-serpent creatures date back thousands of years. The Tlanchana is the most famous of these mermaid creatures and she hails specifically from the small lakes and rivers around the modern-day towns of Metepec, Toluca and Lerma. There is a sculpture of the Tlanchana in the central square of Metepec and she is the subject of an annual arts and culture fair in that town. The freshwater mermaid stories are said to go back a few thousand years and were first noted among the Otomi people, an indigenous group which pre-dated the Aztec Empire in central Mexico. Around 1000 AD the Otomis were the primary cultural force in the lake region of central Mexico and were comprised of several groups with somewhat related dialects and a similar belief system. At the time of the Aztec arrival, the primary Otomi city was called Xaltocan named after the island on which it was founded and named after the lake in which the island was located. Lake Xaltocan was really just the extreme northern branch of Lake Texcoco separated by the main lake by a narrow neck and marshes. In the Aztec language, Nahuatl, Xaltocan means “sandy ground of spiders.” The Otomi band that lived in Xaltocan was called Xaltocameca and the Xaltocameca believed in the supremacy of the moon goddess, which was worshipped as their primary deity. One of the aspects or manifestations of the moon goddess was called Acapaxapo. In the Otomi dialect of Xaltocan, the word Acapaxapo loosely translates to “water weed mirror.” The Acapaxapo appeared out of the lake and was seen as the goddess of intuition and of the future. The Xaltocamecas would call upon her to deliver messages and omens and to impart predictions. She was often “felt” and assumed a spirit form, but sometimes Acapaxapo took on a physical body. She was often described as having the upper body of a woman with long hair and pale skin. She had light eyes. She wore jewels covering her neck and breasts that were illuminated by moonlight. Her lower body was that of a black water serpent. The Acapaxapo could be seen or summoned at Lake Xaltocan, but could appear in any body of fresh water including streams and rivers and smaller lakes and ponds in the Otomi homeland. The Tlanchana was somewhat syncretic in that it was based on the older Otomi Acapaxapo but was combined with a slightly different spiritual view of the world of the Aztecs. For one, the Tlanchana was no longer a 100% benevolent being. While her older version was seen as a helpful spirit and associated with the moon who was the female deity who created all life, the Aztec version could be good or evil and was mostly malicious. In this aspect she was closer to the European version of a mermaid, that of the temptress who causes the downfall of men and who acts of out jealousy or has selfish intentions. While the Otomi built altars to their half-female, half-snake water spirit, the Aztecs looked upon the Tlanchana with a certain degree of cautious respect. The Tlanchana was more of a whimsical dark sorceress, an enchantress, often lonely and often envious of humans. She only appeared at night and her appearance was almost always a bad omen. According to Aztec legends, she would also sing or cry for help to lure men to their dooms, much like the European mermaid. If she wished, the Tlanchana could also grow legs, so that she could more easily move about the human population, but this was rare. At the time of the Spanish conquest, men who worked on the lakes, either catching fish or hunting waterfowl, would give offerings to the Tlanchana for safe boating or for a good bounty. A Spanish priest who, right after the Conquest, lived in the small indigenous community of Almoloya del Rio on the shores of Lake Chicnahuapan just north of Toluca, wrote that the Tlanchana was a demon and the practice of her worship should be eradicated. The Spanish then did what the Aztecs had done before them: they took the previous belief system and modified it. The Tlanchana idea transformed once again and the post-Conquest female water spirit turned into a very European-looking mermaid, complete with a dolphin-like flipper, often blonde, and joyfully playing a guitar. The guitar-playing mermaid can be seen today throughout the crafts of central and southern Mexico, especially in and around Metepec. 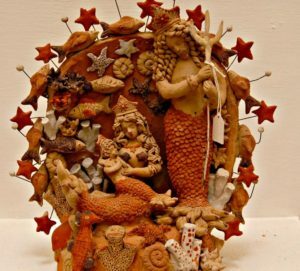 The Tlanchana can sometimes even be found as a character in hand-crafted nativity sets, attending the Baby Jesus along with the Three Wise Men, the angels and the shepherd boys. Many legends and myths often find themselves based on reality. It is not our purpose on Mexico Unexplained to come to conclusions about such things, but some people believe that the Tlanchana could be a real creature or based on something real that is experienced at the lakes and other bodies of water, especially at night. There are several modern-day stories of Mexican lake mermaids and many people in central Mexico believe that the stories are indeed real. Here are three of them. On the shores of the small lake called Laguna de Huamuxtitlan in the Mexican state of Guerrero there is a story of a Tlanchana emerging from the water and calling a young man from the lake. The laguna has been seen as a sacred and spiritual place for centuries. 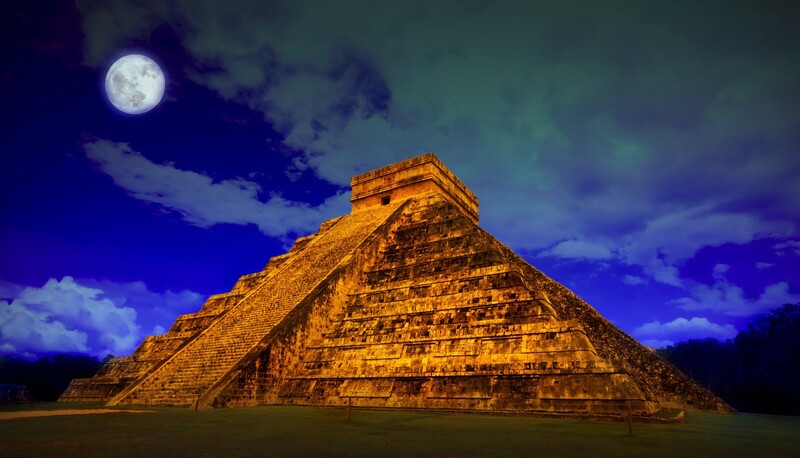 It was so important to the Aztecs that they built 14 small pyramids on its shores. There is a small intermittent spring coming out of a rock wall on the shores of the lake and the Aztecs once believed that the spring was a portal to another world. In this modern Mexican tale, the young man’s impulse was to run away from the noise which grew increasingly louder as he ran. When he got back to his village he told the townsfolk of his experience and dozens of men returned to the lake with machetes and torches to get to the bottom of things, but found nothing. Overlooking the town of Toluca, the capital of the Mexican state of Mexico, is a huge dormant volcano called Nevado de Toluca. The mountain is often snow-capped and in the more temperate seasons there is a small lake which forms in the center of the caldera. According to legend once there was a man who went to the mountain with his daughter to gather snow. The little girl was drawn to the lake and went to the water’s edge to wash her face. While washing, she fell in the lake and was pulled by an unseen force to the depths of the icy waters. When the man realized that his little girl was missing he became frantic and called out to her. The voice of the girl replied and told the man that she had fallen into the lake and that she was safe but under a spell by the spirit of the lake and could not leave. She also told her father that she had been transformed into something half fish. Distraught and able to do nothing, the father left his daughter at the top of the mountain. Thus, the little girl became probably the only mermaid in the world to be living at 15,300 feet. The last legend that we will briefly examine here comes from a small lake near Puebla called Laguna de Aljojuca. There, the Tlanchana is an evil and jealous spirit who guards the lake. It is said that women who enter the lake or accidentally fall into the lake survive, but men never do. If you are a man and you wish to cross the lake in a boat, the Tlanchana will capsize your boat and will drown you. The same goes if you try to swim or go knee-deep around the edges. According to the locals, if a man ventures into the laguna a woman will appear with the tail of a snake and the blue-eyed face of an angel, and that is the last face you will see. This more severe tale of the Tlanchana could have been invented to make sure children stay away from the water, or to punish unruly children, much like the story of La Llorona. Please see episode # 2 of Mexico Unexplained for the legend of the Llorona. But, back to the stories surrounding the lake at Aljojuca… while doing research for this podcast I came across a comments section in an online article about the legends from this lake with many comments coming from local residents. Those who chimed in and wrote claimed that the Tlanchana living in that lake is 100% positively real and is a cryptid or unknown creature much like Bigfoot or the Loch Ness Monster. A young man in the same comments section noted that he participated in a triathlon which had its swimming portion in that lake and all the male triathletes miraculously survived. As commenting on the internet is prone to play out, the triathlete was ridiculed and called a liar or a troll by those who claimed to have actually seen or heard the evil mermaid in Lake Aljojuca. The whole story and reactions to it just show to us the sheer power of belief in myths and legends, even in the age of the internet. I always wanted to believe in mermaids. Nice to know I’m not alone. Thanks Robert! I just found a clay sculpture of stacked animals (turtle, aligator, frog, fish) with a mermaid on top. She is posed as if she was holding a gituar, but that is missing. I noticed that this is a minor theme in some sculptures, always the same animals, order mixed up but always turtle on bottom. Do you know of any stories associated with this? (The sculpture was found in a random thrift store in NC, so there is no context) Thanks! Very interesting. I have no stories associated with the turtle and that stacking of animals. It almost sounds Indian (from India). I have seen that type of art.